Inspired by the lovely crunchy pickles found in London street food markets accompanying falafel salad, I decided to make my own. 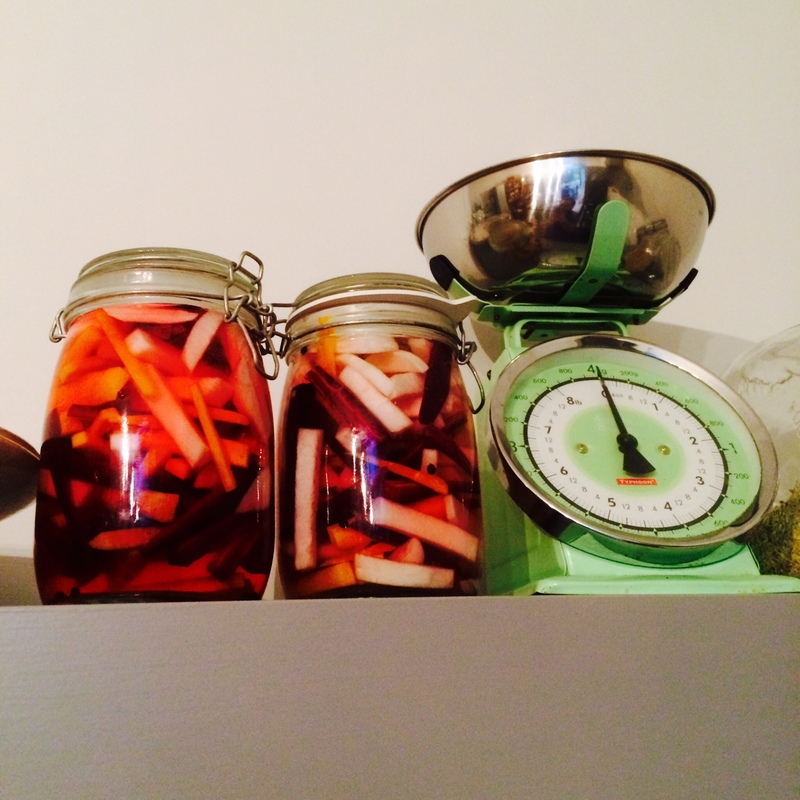 The common pickled vegetables found with the salads I have had, are cucumber (gherkins) and turnips. As luck would have it, this week I got some lovely turnips in my veg delivery from Abel and Cole. I popped to borough market as I wanted some nice carrots to pickle with the turnips and got some lovely purple and yellow ones. 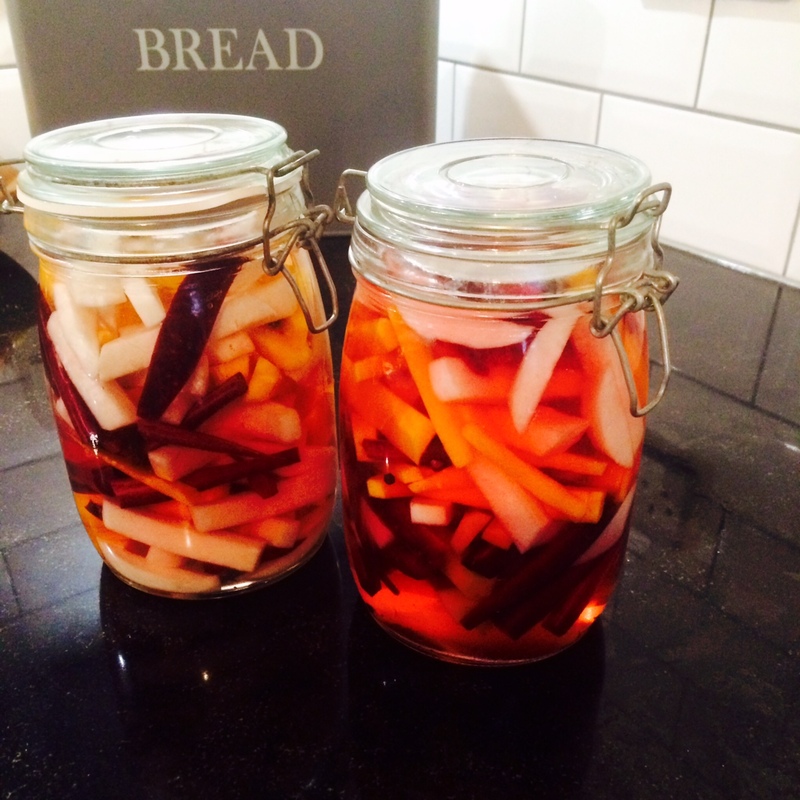 The benefit of using purple carrots is that they stain the turnips a lovely vivid pink during the process of pickling. If you can’t get purple carrots a slice of two of beetroot will do the same job. To gauge the amount of brine you require, fill the jars with water so that the veg is covered. Drain the water and measure the volume. Now you know the amount of liquid needed, measure 50% water and 50% vinegar into a saucepan and put on the heat. Add 50g fine sea salt for each litre of liquid and stir until dissolved completely. Throw in your aromatics before pouring over the vegetables and sealing the jars. That’s it. Now leave these jars for at least 5 days before sampling, the flavour will gradually change over time, they should last for at least a month, probably much longer. You should open the jars periodically to release the gas that till build up during the fermentation. As mentioned these pickles are perfect for a falafel salad but they go with pretty much anything, they are less intense than the pickled veg you may remember from childhood (and now avoid) as we are using much less vinegar, as a result they taste fresher. Great for sticking in a Christmas hamper! I liked your previous post on Sauerkraut and resolved to give it a try – but this one feels easier so I’ll do that first. One question though – pink turnips – why is that a good idea? !